WeWork is an American company that provides shared workspaces for technology startup subculture communities, and services for entrepreneurs, freelancers, startups, small businesses and large enterprises. Founded in 2010, it is headquartered in New York City. As of early-January 2019, WeWork had a valuation of roughly US$47 billion and managed 10,000,000 square feet (930,000 m2) of office space. WeWork designs and builds physical and virtual shared spaces and office services for entrepreneurs and companies. The company’s 100,000+ members have access to health insurance, an internal social network, social events and workshops, and an annual summer retreat. 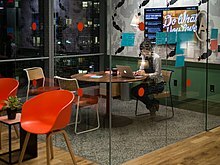 WeWork has more than 5,000 employees in over 280 locations, spread across 86 cities in 32 countries including Australia, Argentina, Belgium, Brazil, Canada, Chile, China, Colombia, Czech Republic, France, Germany, Hong Kong, Indonesia, Ireland, India, Israel, Japan, Malaysia, Mexico, Netherlands, Peru, Philippines, Poland, Russia, Singapore, South Korea, Spain, Sweden, Thailand, Vietnam, United Kingdom and United States. In January 2019, WeWork announced it would be rebranding to The We Company. In March 2019 WeWork confirmed it laid off "3 percent of its global workforce, or roughly 300 employees". 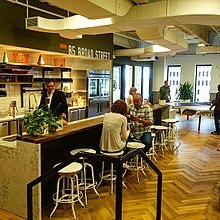 The kitchen area at a WeWork space in New York. Conference rooms at a WeWork space in San Francisco. In May 2008, Israeli-born Adam Neumann who grew up in a kibbutz, and American-born Miguel McKelvey who grew up in a commune, together established GreenDesk, an "eco-friendly coworking space" in Brooklyn. In 2010, Neumann and McKelvey sold the business and started WeWork with its first location in New York’s SoHo district. By 2014, WeWork was considered "the fastest-growing lessee of new office space in New York" and was on track to become "the fastest-growing lessee of new space in America." "During the economic crises, there were these empty buildings and these people freelancing or starting companies," Neumann told the New York Daily News. "I knew there was a way to match the two. What separates us, though, is community." WeWork members have included startups such as Consumr, HackHands, Whole Whale, Coupon Follow, Turf, Fitocracy, Reddit and New York Tech Meetup. In 2011, PepsiCo placed a few employees in the SoHo WeWork, who acted as advisors to smaller WeWork member companies. The first WeWork Labs opened in New York’s SoHo in April 2011. WeWork Labs functions as a startup incubator within WeWork. It provides an open workspace with the goal of encouraging collaboration among members who "don’t have their business ideas fully cooked." WeWork investors as of 2014 included J.P. Morgan Chase & Co, T. Rowe Price Associates, Wellington Management, Goldman Sachs Group, the Harvard Corp., Benchmark, and Mortimer Zuckerman, former CEO of Boston Properties. As of January 2015, WeWork had 51 coworking locations in across the U.S., Europe and Israel – twice as many as it had at the end of 2014 with plans to expand to reach every continent (except Antarctica) by 2017. On June 1, 2015 WeWork announced that Artie Minson, former Chief Financial Officer of Time Warner Cable, would join the company as President and Chief Operating Officer. WeWork was named among the "most innovative companies" of 2015 by Fast Company magazine. It was announced on March 9, 2016, that WeWork raised $430 million in a new round of financing from Legend Holdings and Hony Capital Ltd., valuing the company at $16 billion. As of October 2016, the company had raised $1.7 billion in private capital. In October 2016, the company announced their plans to open a fourth location in Cambridge/Boston area. WeWork opened offices in Boston's Leather District and Fort Point in 2014 and have plans in place for a larger office in Back Bay. The first Cambridge office will be in Central Square and have space for 550 desks. On January 30, 2017, the Wall Street Journal wrote that "SoftBank Group Corp. is weighing an investment of well over $1 billion in shared-office space company WeWork Cos., in what could be among the first deals from its new $100 billion technology fund. "In April 2017, WeWork launched an online store for services and software for its members. The company has also started offering fitness classes at a number of its locations and is opening a gym at a New York location. In July 2017, after an investment round the valuation of the company reached $20 billion. Later that month, it was announced that WeWork would expand heavily into China, with US $500 million invested by SoftBank, Hony Capital and other lenders to form a standalone entity called WeWork China. In September 2017, WeWork expanded into Southeast Asia via the acquisition of Singapore-based SpaceMob, and it set aside a budget of $500 million to grow in Southeast Asia, which houses over 600 million people. WeWork's top competitor in China is Ucommune, which is currently valued at $1.8 billion, making it the only Chinese unicorn in the co-working space. In late October 2017, WeWork bought the Lord & Taylor Building on Fifth Avenue in Midtown Manhattan from the Hudson's Bay Company for $850 million. After Christmas 2018, the Lord & Taylor store will be downsized to 150,000 square feet, renting the bottom floors, with the remaining space to be WeWork's headquarters. The deal also includes the use of floors of certain HBC owned department stores in New York, Toronto, Vancouver and Germany as WeWork’s shared office workspaces. In January 2018, students taking online university courses from 2U gained access to WeWork common spaces and meeting rooms. In February 2018, WeWork relaunched their WeWork Labs brand, designed to support young businesses like a startup accelerator. Instead of taking equity, WeWork funds the operation by charging startups rent for office space. The program rebooted with 27 spaces in 16 markets. As of January 2019, they operate 37 locations in 22 cities and 12 countries. In March 2018, SEC filings indicated that WeWork had raised over $400 million alongside private equity fund The Rhone Group to start a fund to purchase properties directly. In April, documents filed by the company in association with a plan to raise $500 million through the issue of high-yield bonds showed that the company's revenues rose in 2017, but costs rose faster, and the company owed $18 billion rent. In July 2018, the company restricted employees from expensing meals that contain red meat, pork, or poultry. WeWork also announced that it would not provide meat for events at its locations or allow meat at self-serve food kiosks in WeWork locations. The policy was rolled out to cover employees globally. In July 2018, WeWork closed a $500 million funding round aimed at expanding its business in China and valuing the company's subsidiary at $5 billion. In January 2019, WeWork secured an additional $2 billion from SoftBank Group Corp. Though it had considered investing as much as $16 billion in WeWork but downsized plans as it dealt with turbulence in financial markets and opposition from investment partners. In late-January 2019, WeWork announced that it would move into two floors of a building in Tampa Heights in 2020 as part of their expansion into Tampa. In March 2019 WeWork confirmed it laid off "3 percent of its global workforce, or roughly 300 employees". On October 13, 2017, the company announced an acquisition of Flatiron School, a coding school offering classes online and at a location in Manhattan. During the $32 million series B of a women's only co-working space, The Wing, WeWork contributed a portion of the fund. In November 2017, WeWork acquired Meetup. In March 2018, WeWork acquired Conductor. In April 2018 it was announced that WeWork had merged its China operations with local competitor Naked Hub. In August 2018, WeWork acquired Designation, a Chicago-based, for-profit design school. In September 2018, they acquired Teem, an office management software company. WeWork launched a separate but related "co-living" venture called WeLive in 2016. WeLive applies the same basic principle of WeWork to housing, offering rental apartments that are grouped together with a number of shared spaces and services, such as cooking, cleaning, and laundry, as well as group activities and events. The first tests of the concept launched in New York City and also in Crystal City, Virginia, near the Ronald Reagan National Airport in the Washington metropolitan area. Leaked internal documents from 2014 stated that WeLive is projected to make up 21% of WeWork's revenue by 2018. By the end of 2016, WeLive has mostly phased out subsidies for its spaces in New York City under a "friends and family" arrangement that discounted rents by 15% to 20%. Competitors to WeLive include Common, headquartered in New York, and HubHaus, headquartered in San Francisco. Rise (previously known as WeWork Wellness) is a luxury gym concept, currently only available at WeWork's Manhattan location. The space consists of a yoga studio, boxing area, a boot-camp space with cardio equipment, and a general workout area. It also hosts fitness classes and offers personal training sessions. The location also has a spa. Announced in November 2017 for a planned opening in fall 2018, WeGrow is a private school for kids aged 3 through students in grade 4. The first permanent location will be located in WeWork's New York headquarters. ^ a b Gellman, Lindsay; Brown, Eliot (15 December 2014). "WeWork: Now a $5 Billion Co-Working Startup". The Wall Street Journal. The Wall Street Journal. Archived from the original on 2 April 2015. Retrieved 13 March 2015. ^ "SoftBank to invest additional two billion U.S. dollars in WeWork: sources". news.cgtn.com. Retrieved 2019-02-01. ^ a b c d Sheftell, Jason (22 July 2011). "WeWork gives alternative to working at home with swanky buildings across NYC". Daily News. Daily News. Archived from the original on 2 April 2015. Retrieved 13 March 2015. ^ Sweeney, Deborah. "Best of 2011: My 5 Favorite Startups". Forbes. Forbes. Archived from the original on 2 April 2015. Retrieved 13 March 2015. ^ a b Torrance, Jack (9 January 2015). "'Our biggest competitor is work itself' - Adam Neumann, WeWork". Management Today. Management Today. Archived from the original on 10 March 2015. Retrieved 13 March 2015. ^ "The next Mark Zuckerberg". CNN Money. CNN Money. Archived from the original on 2 April 2015. Retrieved 13 March 2015. ^ Tiku, Nitasha (5 May 2012). "WeWork Labs Opens San Francisco Incubator, Starts Offering Health Insurance to All WeWork Members". Observer. The Observer. Archived from the original on 2 April 2015. Retrieved 13 March 2015. ^ a b Logan, Tim (2016-10-18). "WeWork comes to Cambridge". Boston Globe. Archived from the original on 2016-10-20. Retrieved 2016-10-19. ^ WeWork. "Coworking, Office Space - All Locations | WeWork". WeWork. Archived from the original on 2017-11-19. Retrieved 2017-11-21. ^ Brooker, Katrina (2019-01-08). "Exclusive: WeWork rebrands to The We Company; CEO Neumann talks about revised SoftBank round". Fast Company. Retrieved 2019-01-08. ^ a b "WeWork confirms it has laid off 300 employees". TechCrunch. Retrieved 2019-03-04. ^ a b c d Konrad, Alex. "Inside The Phenomenal Rise Of WeWork". Forbes. Forbes. Archived from the original on 7 February 2015. Retrieved 13 March 2015. ^ Shontell, Alyson (15 February 2013). "WeWork Labs, Home To 350 Founders And Startups Like Reddit And Fitocracy, Is Opening 2 More Locations". Business Insider. Business Insider. Archived from the original on 3 March 2015. Retrieved 13 March 2015. ^ a b c Weintraub, Arlene (6 April 2011). "WeWork Labs Gives New York Entrepreneurs a Home Before They're Ready For an Office". Xconomy. Xconomy. Archived from the original on 21 February 2015. Retrieved 13 March 2015. ^ "Adam Neumann". 24 September 2015. Archived from the original on 5 June 2016. Retrieved 6 June 2016. ^ "WeWork Announces Artie Minson as President and Chief Operating Officer". MarketWatch. MarketWatch. 1 June 2015. Archived from the original on 17 October 2015. Retrieved 1 June 2015. ^ Kessler, Sarah. "Most Innovative Companies 2015". Fast Company. Fast Company. Archived from the original on 12 March 2015. Retrieved 13 March 2015. ^ "WeWork, the Communal Office Startup, Raises New Financing". The Wall Street Journal. The Wall Street Journal. 9 March 2016. Archived from the original on 14 April 2016. Retrieved 9 March 2016. ^ Farrell, Maureen (2016-10-12). "WeWork Raises $260 Million, Capping Off $690 Million Funding Round". Wall Street Journal. ISSN 0099-9660. Archived from the original on 2016-10-13. Retrieved 2016-10-14. ^ a b "WeWork launches store for services and software". BetaNews. 2017-04-27. Archived from the original on 2017-04-28. Retrieved 2017-05-31. ^ Bertoni, Steven. "WeWork Hits $20 Billion Valuation In New Funding Round". Forbes. Archived from the original on 2017-09-25. Retrieved 2017-09-25. ^ Julie Zhu, Elzio Barreto (July 26, 2017). "WeWork launches China unit with $500 million funding from Hony, SoftBank". Reuters. Archived from the original on July 31, 2017. Retrieved July 30, 2017. ^ Jon Russell (July 26, 2017). "WeWork launches dedicated China business backed by $500M from investors". TechCrunch. Archived from the original on July 29, 2017. Retrieved July 30, 2017. ^ Russell, Jon. "China's UrWork invests in Indonesia's ReWork via $3M deal as WeWork rivalry heats up". TechCrunch. Archived from the original on 2017-12-01. Retrieved 2017-11-20. ^ Vandaelle, Ian (24 October 2017). "HBC raising $1.7B in Manhattan property sale and share financing". Business News Network. Archived from the original on 7 November 2017. ^ de la Merced, Michael (24 October 2017). "Lord & Taylor Building, Icon of New York Retail, to Become WeWork Headquarters". The New York Times. Archived from the original on 2017-10-24. ^ Shaw, Hollie (1 November 2017). "HBC mulls reported 3 billion euro offer for lagging European business". Financial Post. Archived from the original on 3 November 2017. ^ "Hudson's Bay Company Responds Land & Buildings Press Release" (Press release). 2 November 2017. Archived from the original on 7 November 2017. ^ Zaleski, Olivia (22 January 2018). "WeWork Is Turning Its Offices Into Study Halls". Bloomberg News. Archived from the original on 25 January 2018. Retrieved 25 January 2018. ^ a b "WeWork Labs, startup-focused co-working space, relaunches". TechCrunch. Retrieved 2019-01-30. ^ "Rebooted startup program WeWork Labs celebrates its one-year anniversary". TechCrunch. Retrieved 2019-01-30. ^ Rowley, Jason D. (March 12, 2018). "Per SEC Filings, WeWork Has Raised Over $400 Million To Buy Its Own Properties". Crunchbase. ^ Ghosh, Shona (April 25, 2018). "WeWork documents reveal it owes $18 billion in rent and is burning through cash as it seeks more funding". Business Insider – via San Francisco Chronicle. ^ Hafner, Joshua (July 14, 2014). "WeWork bans meat for employees expensing meals, at company events". Bloomberg. Retrieved 16 July 2018. ^ "Beef lovers call bull on WeWork's meatless edict". Houston Chronicle. 2018-07-18. Retrieved 2018-07-20. ^ Ghaffary, Shirin. "WeWork has closed a $500 million funding round for its China subsidiary". Recode. Retrieved 30 July 2018. ^ Evans, Judith (13 November 2018). "WeWork raises $3bn from SoftBank as losses balloon". Financial Times. Retrieved 14 November 2018. ^ Prang, Allison (January 8, 2019). "WeWork Raises Additional Capital From SoftBank". The Wall Street Journal. Retrieved January 8, 2019. ^ Carollo, Malena (2019-01-29). "Coworking company WeWork is coming to Tampa in 2020". Tampa Bay Times. Archived from the original on 2019-01-30. Retrieved 2019-02-01. ^ Larson, Selena (23 October 2017). "WeWork snaps up coding bootcamp Flatiron School". CNNMoney. Archived from the original on 2017-10-31. Retrieved 25 November 2017. ^ Marinova, Polina (21 November 2017). "Why WeWork Just Invested In This Women-Only Club". Fortune. Archived from the original on 1 December 2017. ^ De Vynck, Gerrit (28 November 2017). "WeWork buys Meetup to bring people together outside of work". Chicago Tribune. Archived from the original on 7 December 2017. Retrieved 25 January 2018. ^ WeWork. "WeWork + Conductor". WeWork. Retrieved 2018-03-08. ^ Chernova, Yuliya (2018-03-06). "WeWork Wades Into Enterprise Software by Buying Conductor". Wall Street Journal. ISSN 0099-9660. Retrieved 2018-03-08. ^ "Wework Is Acquiring China's naked Hub for 400 million". Bloomberg. ^ Grothaus, Michael (28 August 2018). "WeWork just acquired a Chicago design school". Fast Company. Retrieved 4 September 2018. ^ Wilhelm, Alex (12 September 2018). "WeWork Acquires Office Management Software Team, Teem". Crunchbase News. Oath Inc. Retrieved 14 September 2018. ^ Kessler, Sarah (1 November 2016). "From WeWork To WeLive: Startup Moves Members Into Its First Residential Building". Fast Company. Archived from the original on 10 May 2016. Retrieved 13 May 2016. ^ Widdicombe, Lizzie (16 May 2016). "Happy Together". The New Yorker. Archived from the original on 12 May 2016. Retrieved 13 May 2016. ^ Griswold, Alison (21 December 2016). "WeWork is testing how much people will pay to live in its experimental co-living space on Wall Street". Quartz. Archived from the original on 6 April 2017. Retrieved 5 April 2017. ^ Robinson, Melia (June 14, 2017). "Go inside the housing startup that puts millennials up in multimillion-dollar Silicon Valley mansions". Business Insider. Archived from the original on 2017-09-13. Retrieved 2017-09-13. ^ Eldredge, Barbara (31 May 2017). "WeWork is opening gyms in its office spaces". Curbed. Vox Media. Archived from the original on 1 December 2017. Retrieved 25 November 2017. ^ Jacobs, Sarah (20 October 2017). "The most valuable startup in New York City just opened its first gym to compete with Equinox see what it's like inside". Business Insider. Archived from the original on 25 October 2017. Retrieved 25 November 2017. ^ Rosman, Katherine (12 October 2017). "WeWork. WeLive. We Work Out. Eventually We Die". The New York Times. Archived from the original on 1 December 2017. Retrieved 25 November 2017. ^ Edelson, Zachary (2017-10-20). "WeWork Opens Its First Gym, "Rise By We" - Metropolis". Metropolis. Retrieved 2018-05-08. ^ Plagianos, Irene (6 November 2017). "WeWork Is Launching a Grade School for Budding Entrepreneurs". Bloomberg News. Archived from the original on 6 November 2017. Retrieved 25 November 2017. ^ Bonnington, Christina (6 November 2017). "WeWork is starting an elementary school for 'young entrepreneurs'". The Daily Dot. Archived from the original on 1 December 2017. Retrieved 25 November 2017. Wikimedia Commons has media related to WeWork. This page was last edited on 5 April 2019, at 05:36 (UTC).